ANN ARBOR, Mich. -- The University of Michigan Athletic Department officially recognized Gerald Ford as a Michigan Football Legend today (Oct. 13) during a pregame ceremony at the Michigan-Illinois football game. Sophomore linebacker Desmond Morgan (Holland, Mich./West Ottawa) will wear the famed No. 48 jersey for the remainder of his career, switching from No. 44. A Michigan Football Legend patch over the left upper chest will be affixed to the No. 48 jersey worn by Morgan and all other future players donning Ford's jersey number. 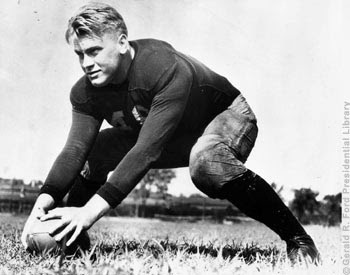 Ford, the 38th President of the United States, was a gridiron standout for the Wolverines in the 1930s. A three-year letterman (1932-34) as a center and linebacker, he was an integral member of Big Ten and national championship teams in 1932 and 1933. A Grand Rapids native, Ford was selected as the team’s Most Valuable Player in 1934. After turning down professional contract offers to play for the Detroit Lions and Green Bay Packers, Ford entered a career in politics. In April 1981, Ford opened the Gerald R. Ford Library on North Campus and in 1999 the University renamed its world renowned School of Public Policy after Gerald Ford. Desmond Howard was the inaugural Michigan Football Legend, honored in 2011 during the first night game in Michigan Stadium history. Howard's No. 21 jersey is worn by senior wide receiver Roy Roundtree (Trotwood, Ohio/Trotwood-Madison) in 2012. Bennie Oosterbaan was recognized as a Michigan Football Legend prior to the 2012 home opener against Air Force, and his No. 47 jersey is being worn by junior/sophomore Jake Ryan (Westlake, Ohio/St. Ignatius). Ron Kramer's No. 87 jersey was recognized prior to the Massachusetts game Sept. 15, and senior tight end Brandon Moore (Trotwood, Ohio/Trotwood-Madison) will wear No. 87 for the remainder of the season. Michigan football greats Francis, Albert and Alvin Wistert also will be honored as Michigan Football Legends prior to the Northwestern game on Nov. 10. In addition to the permanent patch, the Michigan Football Legends will be featured in a special area to be designed and constructed in the soon-to-be renovated Schembechler Hall. Also, the lockers to be used in both the Schembechler Hall and Michigan Stadium locker rooms will be customized to reflect the fact that those names will forever be recognized as Michigan Football Legends.